Designed to be used with a 5-gallon bucket, this fabric strainer fits around the edge of the bucket to filter out pollen, wax, and other impurities. The 400-micron washable fabric helps to create fine-filtered honey that has a beautiful appearance and longer shelf life (takes longer to crystallize). 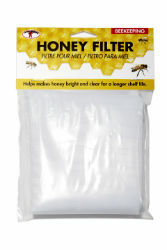 It can be used with or without Little Giant® Stainless Steel Honey Strainer.